CLEMSON, S.C. — Clemson held its first full scale scrimmage of the preseason in Memorial Stadium on Saturday. The Tigers worked for over two hours and ran over 90 plays from scrimmage, plus special teams plays on a beautiful day. There were many outstanding performances, but some mistakes have to be corrected according to Head Coach Dabo Swinney. “We had way too many critical penalties today,” said Swinney. “Those are the things that get you beat. Our kickers were inconsistent today, which was disappointing because you can see they’re very capable in practice. We have a lot of work to do to be ready in front of over 80,000 fans. “Marcus Edmond made a great play on a pick-six, where he jumped the receiver’s route. Charone Peake had a really good day as a receiver (72-yard touchdown reception from Deshaun Watson). I thought Deshaun was excellent all day. A lot of different guys on offense made plays, from Jordan Leggett and Ray-Ray McCloud to Trevion Thompson. Watson completed 5-10 passes for 110 yards and two scores, the 72-yarder to Peake and a five-yarder to Leggett. The running game was balanced. Freshman C.J. Fuller had eight rushes for 80 yards, including a 65-yard touchdown run against the reserve defense. Wayne Gallman had nine carries for 43 yards to lead the backs running with the first unit. Tyshon Dye had six rushes for 35 yards, while C.J. Davidson had 8-24 rushing and Adam Choice added 9-25 on the ground. Zac Brooks did not play in the scrimmage due to a shoulder injury. Germone Hopper had three catches for 37 yards, while McCloud had 2-33 and Hunter Renfrow had 2-10. Ten other players had a reception in the balanced attack. In addition to Peake’s 72-yard reception from Watson, the graduate from Spartanburg also had 50-yard touchdown catch from Watson that did not count after officials ruled Watson had been touched by a defender on the pass and thus sacked. The scrimmage was played with the no tackling of the quarterback rule. Three players on defense had interceptions. In addition to Edmond’s 50-yard interception return for a score, Dorian O’Daniel and Jalen Williams also had interceptions. Travis Blanks had a 50-yard fumble return for a score, giving the defense two scores on the day. Williams, a freshman from Columbia, S.C., led all tacklers with eight, led everyone in tackles for loss with three, had two sacks, a pass broken up and the interception. O’Daniel and Jefferie Gibson added six tackles apiece. Williams and Carlos Watkins had two sacks apiece. Freshman Christian Wilkins had two tackles for loss and a caused fumble. 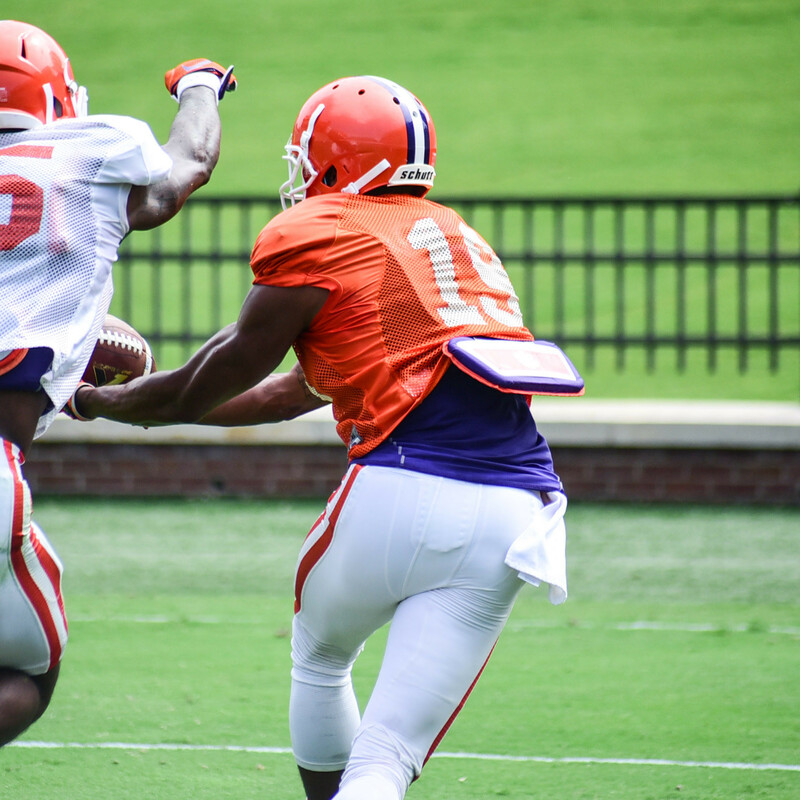 Starting receiver Mike Williams missed the scrimmage recovering from a hamstring pull. He is expected to return next week. Swinney announced after practice that redshirt freshman Korie Rogers of Flowery Branch, Ga., had decided to retire from football. Swinney also announced that punter Andy Teasdall and receiver Hunter Renfrow had been placed on scholarship effective immediately.